Auglaize County Historical Society spring bus trip: 7:45 a.m. to 7 p.m., pickup at north end of Wapakoneta Museum. Traveling to Dayton. Members $63, non-members $73 at auglaizecountyhistory@bright.net. Exterior views of the Aviation Trail Visitor Center and Museum, which is a part of the Wright Cycle Company Complex nd the Wright-Dunbar Interpretive Center in the Dayton Aviation Heritage National Historical Park. WAPAKONETA — The Auglaize County Historical Society will host its annual spring bus trip Thursday, April 25, to Dayton. The bus will leave the north end of the Armstrong Museum parking lot in Wapakoneta at 7:45 a.m. and return at approximately 7 p.m. The trip includes trips to The Wright-Dunbar Interpretive Center & Aviation Trail Visitor Center, The Aviation Trail Parachute Museum, The Wright Cycle Company, Dayton Veterans Administration, Carillon Park, the Wright Brothers National Museum, Woodland Cemetery and Arboretum and Huffman Prairie Flying Field. The event is to celebrate the anniversary of Apollo 11. Price is $63 for members and $73 for non-members. Contact the Historical Society at auglaizecountyhistory@bright.net for a registration form or visit Auglaize County Historical Society on Facebook. The first stop is The Wright-Dunbar Interpretive Center & Aviation Trail Visitor Center. Visitors will learn about Orville and Wilbur Wright and Paul Lawrence Dunbar (who later became an internationally renowned African-American poet). The exhibits highlight the interconnected lives of the three men and the West Side neighborhood in which the center is located. The Aviation Trail Parachute Museum reveals the development of the free fall parachute from its invention at Dayton’s McCook Field after World War I to the vital role its plays in safely landing to-day’s spacecraft. The Wright Cycle Company is one of only two original Wright Brothers’ buildings standing at their original locations in Dayton. The brothers manufactured bicycles and operated a printing business here. During this time the Wright Brothers also took their first steps in developing the airplane. Before lunch the group will make a side trip to view the historic buildings at the Dayton Veterans Administration. The National Home for Disabled Volunteer Soldiers (NHDVS) was made possible by congressional legislation signed by President Abraham Lincoln on March 3, 1865. Many of the buildings at the Dayton facility are listed in the National Register of Historic Places. The Deli at 2nd Street Market is located in a converted 106-year-old freight depot, part of Webster Station’s original historic venue. The exposed brick and wooden beams offer a glimpse into Dayton’s industrial history while maintaining a rustic atmosphere. The spring lunch, will include turkey, ham, and roast beef sandwiches, with assorted cheeses and breads. Accompanying the sandwiches will be the Deli’s housemade pasta salad and cole slaw, and a dessert tray of lemon bars, rockslide brownies, and assorted cookies. Drinks will include water, lemonade, iced tea, and coffee. The Deli’s food consistently receives Five Star ratings. If time allows, tourgoers will have the opportunity to visit the forty vendors at the 2nd Street Market too. After lunch the bus is off to Carillon Park and the Wright Brothers National Museum, which houses more artifacts associated with the Wright Brothers than any other location in the world. Its extra special attraction is the original 1905 Wright Flyer III—the only airplane designated a National Historic Landmark. Tourgoers will be joined by a step-on guide, who will highlight historic sites and neighborhoods across Dayton, including beautiful Woodland Cemetery and Arboretum. Then the group will visit Huffman Prairie Flying Field, where the Wright Brothers continued the development of the airplane. The signature ice cream stop at the end of day will be Jubie’s Creamery, which creates its ice cream one small batch at a time in order to provide unique, always-fresh flavors among many other traditional tasty treats. This one-stop frozen dessert shop fulfills even the largest sweet tooth! 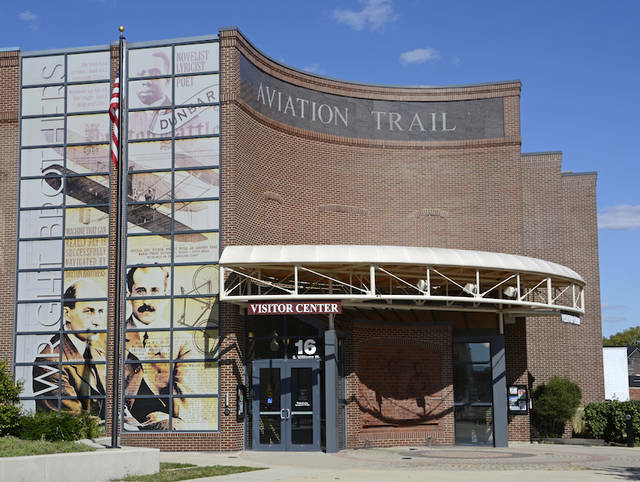 https://www.limaohio.com/wp-content/uploads/sites/54/2019/04/web1_wright-dunbar.jpgExterior views of the Aviation Trail Visitor Center and Museum, which is a part of the Wright Cycle Company Complex nd the Wright-Dunbar Interpretive Center in the Dayton Aviation Heritage National Historical Park.